We had heard rumors that the Windows 8.1 update would be arriving some time in October this year but now we finally have the proper release date. According to a blog post on Microsoft’s Windows blog, the Windows 8.1 update would be released to the general public on October 18 at 12:00 a.m New Zealand time. The Windows 8.1 would also be available at retail outlets and pre-installed on new devices on the same date. For those unaware, Windows 8.1 is the first major update to the Windows 8 operating system and brings many new changes, such as Internet Explorer 11, integrated Bing search, Skype and SkyDrive integration, UI changes and that Start button that everyone missed so much. 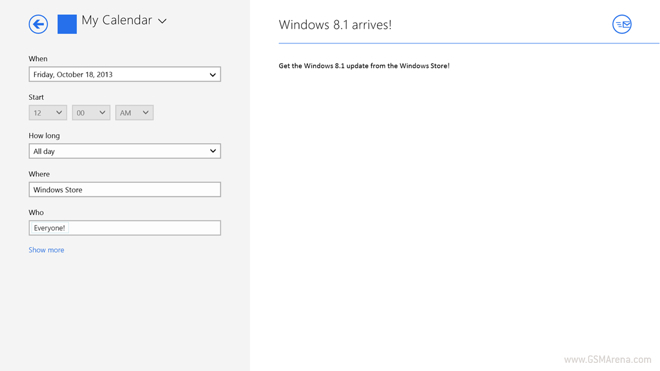 A preview of the 8.1 update is available for download on the Windows Store, with an RTM releasing shortly and the final version on the previously mentioned date.